Today's wedding was out of the usual mould. 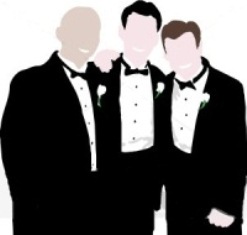 For starters, the groom decided to have two best men for his wedding. I suppose nothing prevents the wedding party from choosing how many bridesmaids and groomsmen they want - best men included. It wouldn't have mattered to me, except when that the mother-butler asked me to get one chair for the other best man. Naturally, the church only reserves one best man chair for a typical wedding. The chair I carried from the altar was heavy. It was solid hardwood. This is one of the chairs near the priest's chair. It is used by the deacon, other priests or priest assistants. I suppose the mother-butler didn't realize that although there was an extra chair for the second best man, there was no extra kneeler though. It was a bit comical for the second best man to go back to one of the pews when it was time to kneel - and then come back out in front for his place near the first best man. If the wedding couple had to insist on a second best man, they could've asked him to sit with just the other groomsmen or made special arrangements with the church beforehand. The church handyman could've brought in an extra kneeler. In a wedding mass, there would typically be three boys who are the "bearers". There's the ring bearer, the arrhae bearer and the bible bearer. In the past, there were only two: the ring and arrhae bearers. These two artifacts have traditionally been essential symbols in the wedding. The bible is a more recent addition. Well today, I only saw two boys and they were carrying only the arrhae and the wedding rings on pillows. They must have stuck to the traditional practice, I thought. So when it was time for me to announce the blessings, I just mentioned the arrhae and rings. Lo and behold, a bible appeared out of nowhere! Apparently the priest knew the wedding couple and produced the bible for them. Just when I thought that the two best men setup was an oddity to this wedding, I witnessed a couple of bloopers in the wedding too. I'm not sure if the male veil sponsor was trying to be funny. When he was putting the veil, he put it over the man's head. This made it look like a blanket over both the wedding couple's heads. The correct practice was for him to put it over the groom's shoulder and the lady veil sponsor to put it over the bride's head. This is the correct placement of the veil in the wedding. There's a symbolism here. Putting the veil over the groom's shoulder, rather than the head, signifies the man's capability to protect and provide for the bride. It's like the veil puts the responsibility squarely on his shoulders. The second I caught this, I immediately raised my voice to instruct the poor guy to lower the veil to the groom's shoulder. Some of the principal sponsors were already snickering at this time. The veil sponsor looked embarrassed, smiling sheepishly on the way back. When the veil and cord are set, the couple are in a kneeling position. They won't be instructed to stand until the veil and cord will be removed. I suppose the groom had other ideas when he attempted to stand together with the congregation. As he was starting to stand, he was pulling the bride's head too because they were both joined by the veil and the cord. Maybe the groom was too nervous and had absolutely no idea what to do. When I got married, I didn't know the correct procedure either but I just instinctively knew that standing up at that point and pulling the bride's head would have a hilarious effect. And yes, for the poor groom, the congregation AND the bride were already laughing at what had happened. Fortunately, I had the presence of mind to quickly to say, "Please all stand, EXCEPT for the bride and groom!" Keep an eye on what is happening with the wedding AT ALL TIMES and anticipate blunders where they're bound to happen.